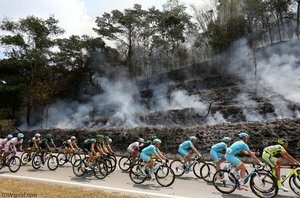 March 1, Stage 3: Kampar - Kuala Lumpur 166.5km Astana Pro Team's Andrea Guardini won Stage 3 at the Tour de Langkawi working with his team which included Ruslan Tleubayev. Despite an injured foot, the Italian sprinter launched his attack early and was able to hold his lead for Astana's first stage win in the 2014 season. Guardini currently holds the record for most stage wins at the Tour de Langkawi with over twelve stage victories. He races at 1.70m with approximately 67kg on the SRM Specialized PowerMeter. 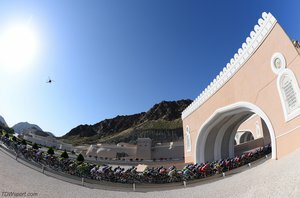 This year's Tour of Oman was teeming with impressive SRM powered performances. Lotto Belisol's powerful sprinter, Andre Greipel, took three stage wins, Peter Sagan sprinted to the stage 4 win for Cannondale Pro Cycling, Orica GreenEdge's Leigh Howard finished second in two consecutive stages, and Tejay Van Garderen was second overall on the podium with BMC Racing Team. SRM Impressions from the Tour of Oman 2014. 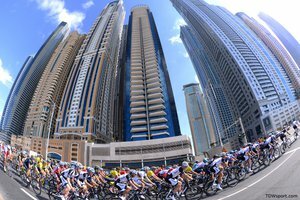 SRM sponsored teams continue to power into 2014 with top results in the Dubai Tour. BMC Racing Team's Taylor Phinney finished 1st Overall with best young rider honors, while teammate, Steve Cummings, finished 2nd. Following Phinney's Stage 1 Time Trial victory (SRM Data Here), Team Giant-Shimano's German sprinter, Marcel Kittel, went on to win the remaining three stages. Other strong SRM-powered performances include Fabian Cancellara's opening time trial for Trek Factory Racing, Cannondale's Peter Sagan Stage 2 and 3 sprints, and Andrea Guardini (Astana) landing third in the final stage 4. SRM sends congratulations for the impressive team work and powerful performances! January 25, Stage 6: Las Chacras - Mirador del Sol 184.4km Trek Factory Racing Team's newest Colombian addition, Julián Arredondo, claimed his second stage win in the Tour de San Luis ahead of Sergio Godoy and Nairo Quintana on the uphill finish atop the Mirador del Sol. Julián, new to the WorldTour, joined Trek this season as a specialty climber with high hopes for the upcoming Giro d'Italia. The training and performance team at Trek Factory Racing shared Arredondo's SRM race file as a continued contribution to data transparency and to show how a climber's race data can be unique to others. Julián races at 164cm with approximately 58kg on the SRM Shimano 9000 11-Speed PowerMeter.